There are many different ways to teach scent detection or nose work. Most evolved from training law enforcement dogs and not only require dogs to have a high toy drive but also use many exotic training aids. We believe that almost any dog can be taught with just a few props (merely food treats and containers). This class will introduce you and your dog to nose work by bringing out your dog's natural desire to hunt. Boxes and other containers will be used indoors. If you want to continue past the intro class, you will need a clicker. You wont use the clicker in this class but you and your dog will learn how to use a clicker to progess to the next level. Again, we will be working indoors mostly and with containers but will be introducing dogs to birch and the concept of a focused response. By the end of the class, most dogs will be working on odor only and should be prepared for their odor recognition test on birch. Completion of NW1 is required. This class continues your introduction to nose work by introducing the special challenges hunting on grass, asphalt and concrete present to dogs. How air flow around vehicles affects scent will also be introduced. A few classes will be indoors so that owners can learn leash handling and indoor pattern searches but most classes will be held outdoors. Dress accordingly. Completion of NW 1 and NW 2 are required. This class will meet each week at a new location. It is a 4 week class and each week we will work on only 1 of the 4 elements - containers, interiors, exteriors or vehicles. Completion of NW 1, 2 and 3 are required. Intro to Nose Work classes now forming in the Harrisburg area. Free intro seminars will be announced soon. 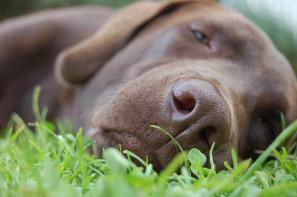 Nose work classes make dogs tired and content!